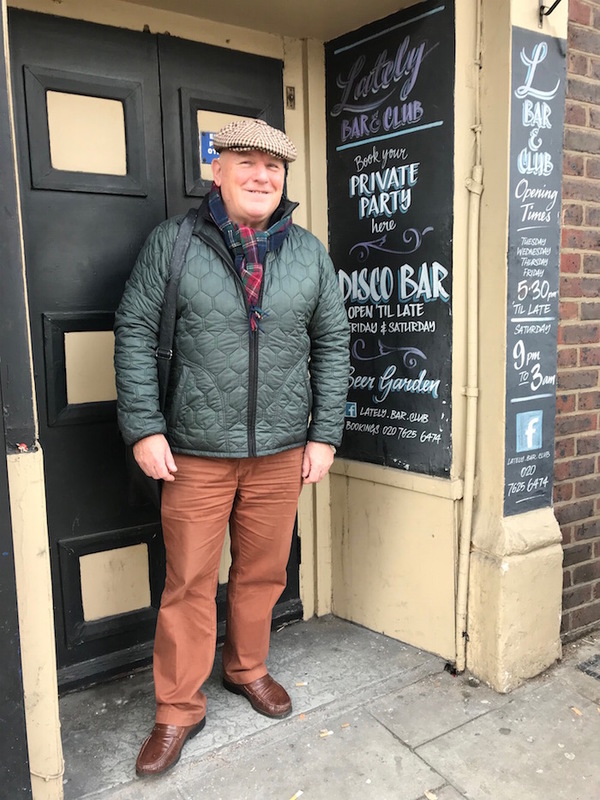 Regular readers will know that West Hampstead nightclub Lately has closed after almost 40 years. We met up with owner Gordon Stevenson. “Buying Lately, that’s what! I opened it 38 years ago after I was offered the club by a friend. Previously it was a called Vincent’s but had been empty for about 18 months and he was offering it for sale. I knew him because those days I had been supplying him his drink, and I bought it from him. When I looking for a name, I was late arriving back from somewhere and my friend said why don’t you call your new late night venue Lately”. Gordon was far to discreet to drop any celebrity names, but he did say that being close to the Central School of Speech & Drama has led to quite a few young actors becoming regulars, and many have gone on to be household names. Gordon of Lately out in daylight! “That’s going back 38 years. In those days it was more a like a village, with independent and small shops, rather than Costa, Starbucks or Tesco. I remember Nick who used to run the hardware shop (called the Funny Little Hardware Shop), with his mother helping out on Wednesdays and his ex-wife helping out too. And also Western Food Store, which has just closed, which used to be a greengrocers which I liked. What has surprised you about how West Hampstead has changed? Given that his life revolved around late-night hospitality, Gordon said he rarely went out for lunch. When pushed, he said he liked the Banana Tree. So what is the latest on Lately? As we reported, the team behind Kilburn Ironworks have taken over the lease and it will become a bar called Heads & Tails. It will keep the late licence (so probably the dancing will continue, but we will have to wait and see). Gordon is really happy about them taking over the licence. To end, Gordon wanted to say a big thank you to West Hampstead for its support over the last 38 years.